Fender Standard Precision Bass Guitar, Maple Neck, Arctic White Finish Since its early-'50s introduction, the Fender Precision Bass guitar h.. Since its early-'50s introduction, the Fender Precision Bass guitar has remained the world standard for thick tone and smooth playability. The Standard Precision Bass combines the best of old and new, with a modern split-coil pickup, shielded body cavity, medium jumbo frets, vintage-style bridge, tinted neck with rosewood or maple fretboard, three-ply parchment pickguard and '70s-style headstock logo. This combination of traditional design with contemporary features makes the Standard Precision Bass a stylish and affordable addition to any bass players arsenal, making it perfect for complete beginners and more experienced players alike. From the most delicately played chord, to the loudest pop and slap combination, and from the tip of the headstock down to the bridge and rear strap button, the very essence of that classic Fender design is in evidence. Both the looks and sounds emanating from this timeless bass guitar evoke memories of those classic Precision bass guitars that preceeded it. As one of the more modern adornments, the Fender Standard Precision features a modern "C"-shaped neck, designed for comfort and performance. The overall shape and dimensions of the neck, along with the smooth back finish, make this bass guitar ideal for bassists who play with their thum on the back or side of the neck. Arguably one of the most recognisable bass guitar pickup tones, and certainly one of the most visibly recognisable pickups out there, there's nothing quite like the classic Fender Split Coil Pickups. For more than half a century, these pickups have been renowned for their clear, punchy and powerful sound, working just as effectively for delicate pop music ballads as for overdriven hard-rock pick-work. 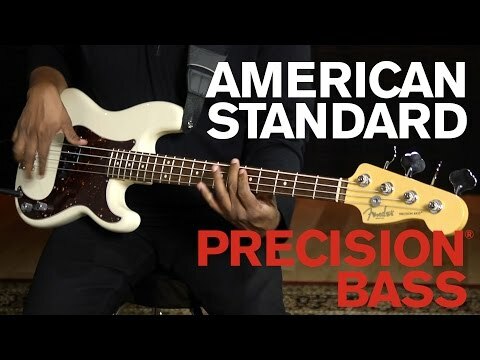 Whether you're a veteran bass player looking to add a little bit of music history to your collection, or a complete novice looking to buy their first full sized bass, the Fender Standard Precision is most certainly for you. If you're not convinced yet, then I recommend contacting your local PMT Store and speaking to one of our in-store product experts to arrange for a demonstration. If you order this product online we can guarantee you a free, quick and reliable next day delivery service, and as this guitar costs more than £300 there are 0% interest finance options available.